My children have been coughing for about a month now. Their coughs have subsided to just night time sleep interruptions, but it is persistent. Their other symptoms have gone away, but the cough remains. Early in the coughing stages, we did visit the doctor and resorted to antibiotics. Whooping cough, bronchitis, pneumonia are all treated with the same antibiotic. Unfortunately, my son will not swallow pills yet, so we were prescribed a cherry flavored antibiotic syrup. It was a disgusting artificial color, grossly over sweetened, and made him gag. Although anything that might give him relief was tempting, we did avoid unnatural cough suppressants following our pediatrician’s advice. My son’s cough was so bad, I might have been tempted to use an OTC cough suppressant had I not been told by our pediatrician that they were not good for children and actually delayed healing. This is especially true for young children. For decades, parents have relied on kids’ cold medicines and cough syrups — typically grape, cherry, or bubblegum flavored — to ease their children’s discomfort. However, the FDA and manufacturers now say that over-the-counter cough and cold medicines should not be given to children under 4. Evidence indicates that children’s cold medicines don’t really help and may pose a real (although small) risk of side effects, particularly to young children. This has cast serious doubt on a common and trusted group of medicines — and left many parents anxious and confused. Which kids’ cold medicines are in question? I was really excited when we were approached to review Dr. Cocoa since my son is particularly sensitive to flavorings in medicines. I hate how kids’ medicines are sickening sweet berry or bubble gum flavored. I was excited that there was a kids’ cough syrup that was chocolate-flavored! I thought our struggles with medicine taking would be over. I was bummed when I read the ingredients. Dr. Cocoa is not natural. I don’t have time to dig into ingredients when responding to emails for reviews, but I do state that I will be evaluating products based on their natural and eco-friendly qualities. I let the PR companies do the work if they should send me their product or not. In this case, they should have been not. We were sent three Dr. Cocoa products: non-drowsy cough, nighttime cough + cold, and daytime cough + cold. Three great cough and cold relief medicine formulas to relieve a variety of cough and cold symptoms for kids. Patented formulas combine trusted, effective ingredients with 10% real cocoa for a rich, soothing chocolate taste that kids like. 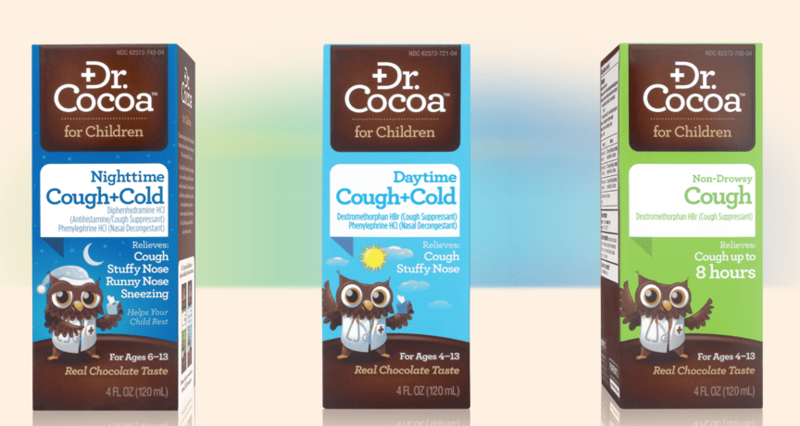 All Dr. Cocoa™ cough and cold relief medicine for kids are dye-free, gluten-free and alcohol-free. I love that they are dye-free. This is so needed in the world of children’s medicine. What I don’t like is the active, “effective” ingredients. Dextromethorphan and phenylephrine are both listed in the above WebMD citation as ingredients to avoid. Granted Dr. Cocoa does state the products are for children ages four to thirteen, I think these ingredients should be avoided at all ages. Still, thousands of children under the age of 12 go to emergency rooms each year after taking cough and cold medicines, according to the Centers for Disease Control. Roughly two-thirds of those ER visits occurred after children drank cough or cold medicine while unsupervised. Use cough suppressants wisely. Don’t suppress a productive cough too much, unless it is keeping you from getting enough rest. Coughing is useful because it brings up mucus from the lungs and helps prevent bacterial infections. People with asthma and other lung diseases need to cough. Sometimes we do need relief from coughing. Essential oils, tea, and other natural means can give such relief without slowing down the body’s own natural ability to heal. Of course, when a cough is persistent and accompanied by other symptoms, it is important to go to the doctor as we did with my son. Here’s practical advice from Jay L. Hoecker, M.D., an emeritus pediatrics specialist at Mayo Clinic, Rochester, Minnesota. What’s the concern about cough and cold medicines for kids? Over-the-counter cough and cold medicines don’t effectively treat the underlying cause of a child’s cold, and won’t cure a child’s cold or make it go away any sooner. These medications also have potentially serious side effects, including rapid heart rate and convulsions. It’s not just the “effective” ingredients in Dr. Cocoa that I find alarming. The inactive ingredients are just as bad. Methylparaben, sorbitol, and sucralose are just a few. There are many natural cough and cold relieving medicines out there. Perhaps I should just add cocoa to them or our own home remedies like our elderberry syrup recipe. Yum! Chocolate elderberry syrup! « Healthy snacking: Who doesn’t love popcorn?